The Checkatrade Trophy has taken its fair share of stick this season, and rightly so. But another tournament caused a stir a few decades ago and was kindly put out of its misery. The initial Anglo-Italian Cup was played as an annual tournament from 1970 to 1973. The first final was abandoned early due to violence, with Swindon Town declared the winners. During its time the tournament had a reputation for violence between fans, but it returned as a semi-professional tournament from 1976 before it was abolished again in 1986. In 1992, the Anglo-Italian Cup was re-established as a professional cup for second tier clubs - it replaced the English Full Members Cup. Strictly professional, and open to clubs from Serie B in Italy and the Endsleigh Insurance Football League in England, the competition reverted back to its original name and format. Scheduled to be played throughout the domestic season, it felt like a proper cup competition. This version of the Cup ran for four seasons, until 1996, before being discontinued due to fixture congestion. It did have a certain romance about it (on paper at least), no other club competition in the world could throw together potential couples such as; Pisa v Middlesborough, Portsmouth v Fiorentina, and Blackpool v Verona. Following a slightly odd English-only preliminary round, the traditional fixtures between two groups of four, an English semi-final, Italian semi-final and Anglo-Italian final, March 27, 1993, saw Derby County outclassed by Cremonese at Wembley Stadium. An impressive crowd of 37,024 saw the Italians prevail 3-1. The Anglo-Italian Cup was back. In one of his last games before leaving for Barcelona, George Hagi helped Brescia dispose of Notts County in the 1993-94 final. In front of just over 17,000 fans at Wembley, under half of the previous year’s attendance, interest appeared to be waning again. While attendance figures were down, more worryingly, the number of headlines reporting Anglo-Italian crowd violence was up. With the Hillsborough disaster and the tragic events at Heysel painfully fresh in the memory, crowd control and crowd behaviour were under scrutiny. Away from the cameras and spotlight of top-flight fixtures, too many fans were using the Anglo-Italian Cup as an excuse to release some pent upanger and aggression. Also hampering the competitions existence, were a number of clubs complaining at the number of fixtures. In what was a second to last throw of the Anglo-Italian dice, Notts County went one better in 1994-95, defeating an Ascoli side including Oliver Bierhoff, 2-1. 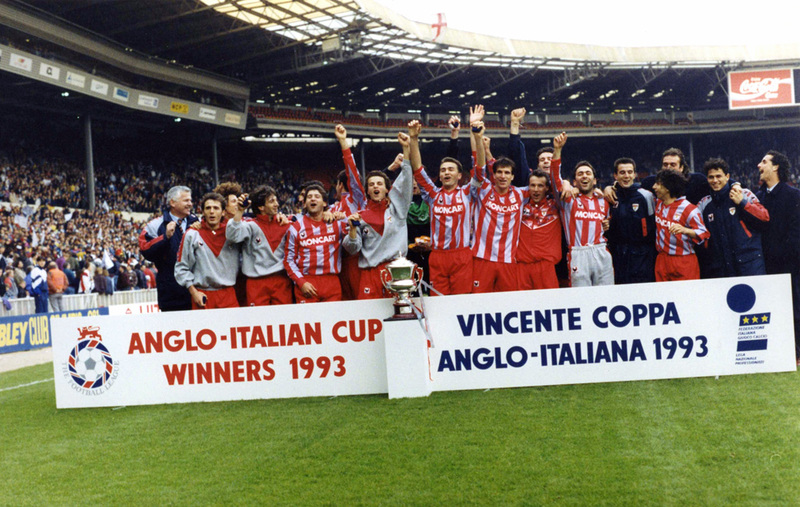 The Anglo-Italian cup took its final bow in 1995-96. Genoa triumphed 5-2 in a Wembley final against Port Vale while the group stages had thrown up some truly unique match-ups in which both Brescia and Salernitana won on a cold and wet night in Stoke, Southend Utd went as far south as Salernitana, Ipswich Town rolled back the European glory years as they hosted Reggiana, and Luton Town were thrashed by Perugia and Genoa. It was nonsensical, naughty, and yet oddly captivating.